The Christmas Tree. It was always fresh and green, but with no particular symmetry, and since my mother never wavered in her tree-decorating style, every Christmas tree in every photo looks like a clone of its predecessor. This tree stands grandly in our beautiful colonial house in Kingston, Jamaica, in front of a big fireplace that served absolutely no other purpose in the tropics than to hold the mantel’s bric-a-brac; in this case a small electric clock and a shiny shell holding a pile of napkins that may have been placed there in preparation for a holiday party in the works. Peeking out at the left is the statue of Kuan Yin, Chinese “Goddess of Mercy and Friend of Mankind.” Evidently friendless in our household, Kuan Yin was mercilessly deemed unsuitable for display after losing a slender porcelain hand, casually dismembered during one of the numerous packings and unpackings that she endured in her lifetime. My mother promises me that the one-handed statue is now carefully wrapped in linen, nestled in a box inside the old ornately inlaid Chinese cedar chest, but I haven’t seen Kuan Yin in so long that I’m pretty sure Mom has forgotten where she parked her. The tree is decorated with hand-blown glass ornaments and heavy drooping metal tinsel acquired in Germany. 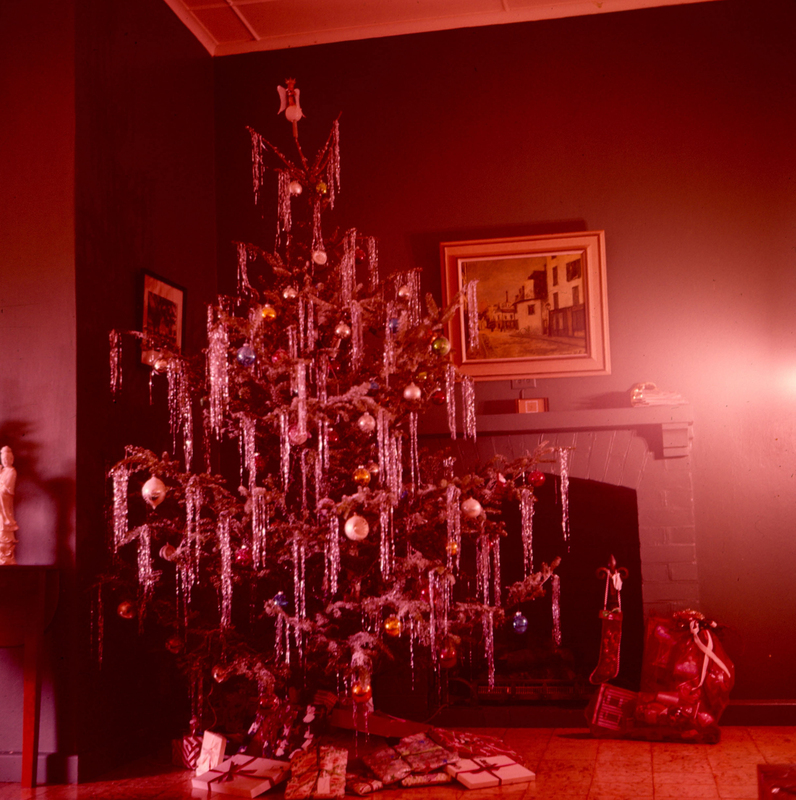 The same bright silver tinsel was re-hung year after year, gradually tarnishing to a dull dark pewter with each use, and on January 7, the dreaded UNDECORATING day, we tediously removed it strand by endless strand from the brittle tree, wrapped it in tissue paper and packed it away in a shoebox. As we cried bitter tears over the loss of the beautiful decorations, the graceful tree-top angel and the tarnished tinsel, my sister and I immediately began lobbying for a replacement tree. But, Mom and Dad were having none of it, and on Christmas Day we opened our gifts sitting on the floor under a potted palm. I loved it! And now I am on my way home… anxiously awaiting gift opening under OUR decorated sterling little coffee table tree :)!!! A great story. I just saw a Christmas Carol at UNLV . and was reminded of our little productions in Athens. I couldn’t remember who played whom but I know I had several parts. What ever happened to that tinsel? We had it too, and it wasn’t Xmas without it. AND we had “bubble-lights”… remember those? And garland, lot of garland!! Nobody has any of that these days… Any way, great post! Thanks, cuz. I just read the whole blog, I love it! I’m so impressed that you understood at such a tender age that “kaka” is indeed universal.